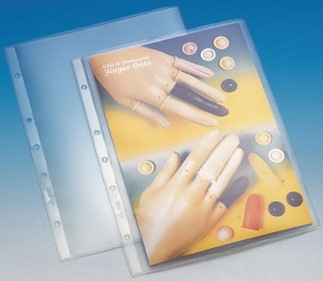 The range of document holders is ideal for ESD sensitive work areas whereby control is critical. They can be used for documenting work procedures, flow charts, traveller sheets and work checklist. Unlike coated materials that degrade after usage, its permanent properties ensure that static electricity is controlled at desirable levels. The sides holes are specially designed for filing purposes with ESD ring files. NOTE: Material appearance is hazy due to impregnanted ESD properties. Does not affect clarity when applied to use.